That universal symbol of comfort and security, the cuddly teddy bear — actually almost a thousand of the furry, fuzzy, facsimile munchkins — are on their way to elementary schools throughout Hillsborough County over the next week. School security officers with Hillsborough County are delivering teddy bears to elementary school sites after the Kiwanis group donated $3,000 toward the purchase of more than 900 teddy bears. Each elementary campus is in line for four to five teddy bears. The little bear dolls are part of a Hillsborough County Public Schools new initiative called The Elementary Teddy Bear Project. 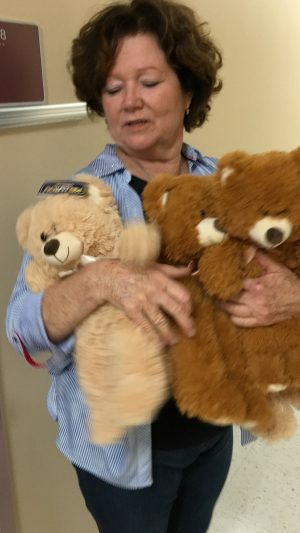 The school district’s Security & Emergency Management office, in partnership with the Kiwanis group, purchased teddy bears for elementary school counselors to loan or to share with traumatized students throughout the school year. This is just one of the innovative strategies the district is using to help with students’ emotional and social learning. The hope is that the teddy bears will allow school psychologists and social workers to help children address unresolved emotional issues that hinder a child’s socialization and learning processes. The School Security Officers are delivering the teddy bears as a way to build relationships with the school district’s most vulnerable students. The teddy bears should help students connect to their feelings and express themselves in constructive ways, establishing a safe and supportive learning environment for every student. Teddy bears ready to go to school as elementary counselors.